If you've ever wondered why we say “March comes in like a lion”, you may find the answer in the evening sky this spring. After twilight, look to the east, and you should be able to find a group of six stars that look like a backward question mark, with the brightest star at the point. The bright star is Regulus, the heart of Leo the Lion. The backward question mark, known as the Sickle, represents the head and mane of this regal beast. Leo's hindquarter is a large right triangle, with the bright star Denebola representing the lion's tail. With a little imagination, you can use those stars to see a lion leaping into our spring skies. The origin of the celestial lion can be traced back to the Babylonians where it was later inherited by the ancient Greeks and became an important part of their mythology. The Greeks believed the lion originated from the moon and later fell to the earth to torment the people of Nemae. The Nemaean Lion was much larger than his terrestrial cousins and his coat was impervious to fire and metal weapons. The terrified people of Nemae were desperate for help. Hercules, the son of Zeus and the strongest man in the world, was sent to kill the lion in the first of his Twelve Labors. After failing to kill the lion with spears and arrows, Hercules wrestled the lion to death and then skinned the lion with his own claw. To stargazers, Leo is best known for its wealth of bright galaxies. To observe these “island universes” you'll need a telescope with a lens or mirror at least 6 inches in diameter. More importantly, and much harder, you'll need clear, dark skies free of light pollution. Another helpful aid to discovering these galaxies for yourself is a star atlas. However, if you point your telescope and just the right spot you're likely to stumble across a cluster of galaxies. Placed behind the tail of Leo the Lion and above the V-shaped form of stars in the constellation Virgo is the Virgo Cluster of Galaxies. Dozens of galaxies are visible in this region of the sky, but the easiest ones to track down are part of the Messier Catalog; a collection of 110 of the best deep sky objects. The most difficult part of exploring the Virgo Cluster is that at times you'll confuse one galaxy with another. 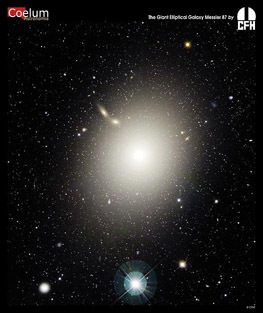 The king of the Virgo Cluster is M87, also known as Virgo A. It's an elliptical galaxy containing at least a trillion stars and is surrounded by thousands of globular clusters. At the heart of M87 is a supermassive black hole which has an estimated mass of 2 billion suns. However, this monster galaxy appears as nothing more than a puffy ball of gas through most amateur telescopes. This can be forgiven when you take into account the fact that M87 is located 50 million light-years from earth. When you understand what you're looking at, faint fuzzies take on a whole new appearance. M87 image courtesy of the Canada-France-Hawaii Telescope web site.